Barkcloth is a heavyweight, cotton fabric with a rough textured surface. Do not confuse this with a textile made from the bark of various trees: breadfruit, fig and paper mulberry found in South America and more frequently, Polynesia. 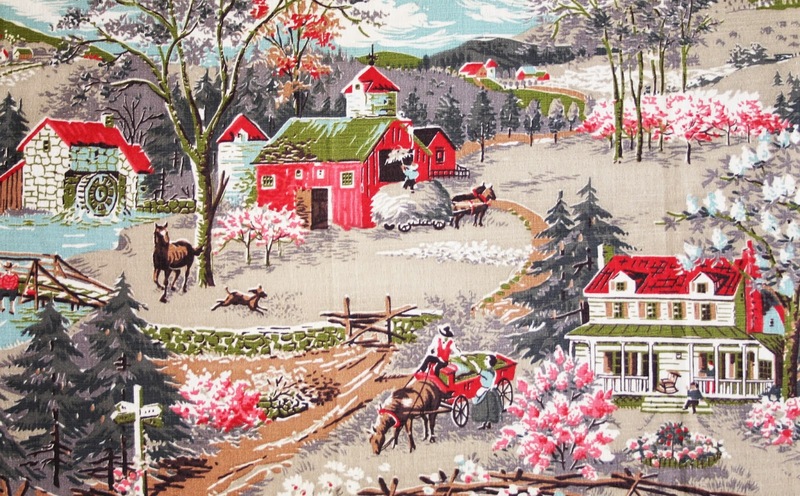 Grandma’s barkcloth was manufactured in the late 1940’s and 50’s when fine fabric was scarce due to WWII. It is usually associated with large-scale prints of tropical florals and birds. 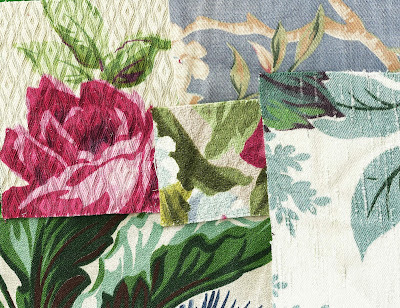 These fabrics were bold in palettes of chartreuse, yellows, vivid greens and corals. 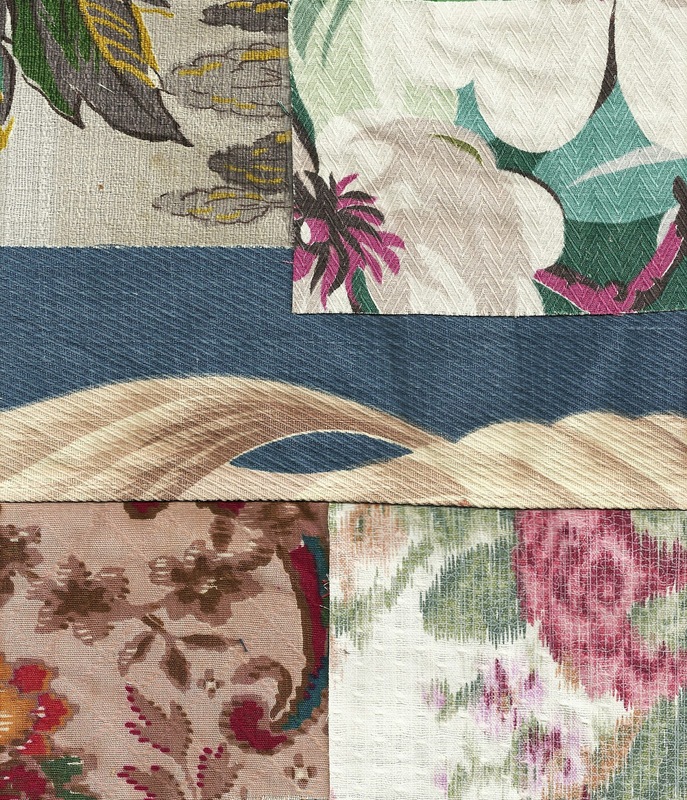 Occasionally, the tone was more refined featuring stripes and softer colors of blues and creams. 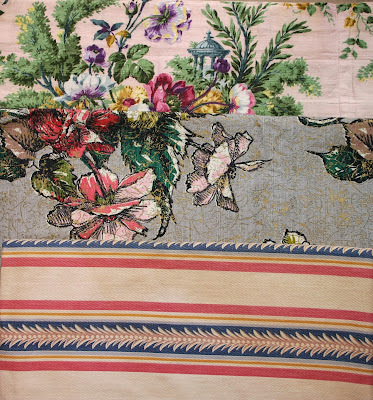 Because of their terrific graphic qualities and the sturdiness of the weave, barkcloth became very popular as an upholstery fabric, especially for porch and patio furniture. I remember seeing it on furniture in my grandmother’s “Florida Room”, as sun rooms were often called, although she lived nowhere near Florida. Actually, the climate wasn’t really sunny most of the time either. Today “patio prints” of barkcloth are very popular once again and vintage barkcloth is fetching surprising prices. 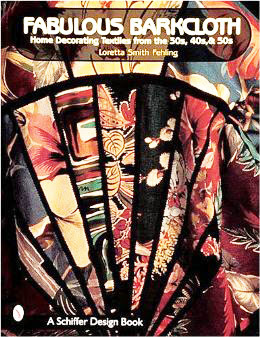 One word of caution, most vintage remnants lived a prior life as curtains, draperies or upholstered pillows and cushions. If the fabric was placed in a room with direct sunlight and heat (they didn’t call them sun rooms for nothing) the textile will have become fragile and often fractures or splits will occur with reuse. If you are planning on using this type of fabric for upholstery consider purchasing a reproduction and save the vintage for pillows and small accessories. 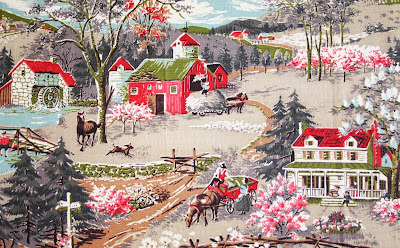 Occasionally, one might find textured, heavy, cotton fabrics depicting a bucolic scene reminiscent of toiles, incongruous though it sounds, a finely etched design on linen or cotton compared to a printed scene on roughly textured fabric. 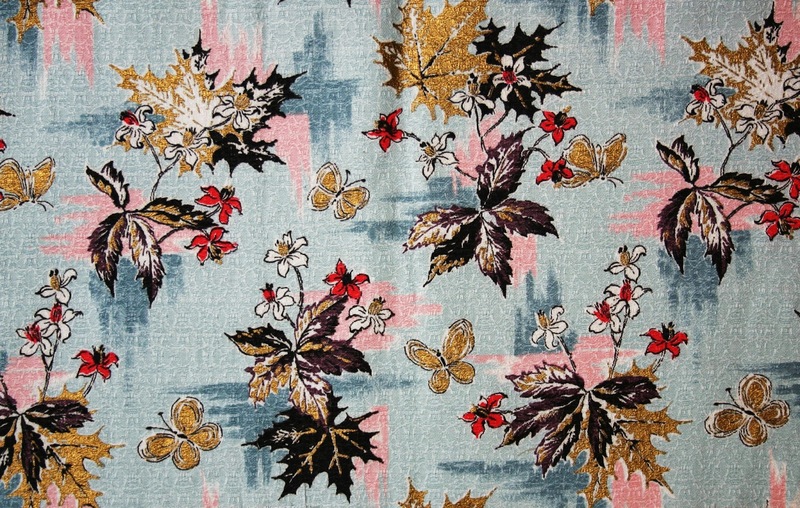 These mid twentieth century fabrics were produced for the middle class market by companies such as Waverly Fabrics and F. Schumacher & Co.